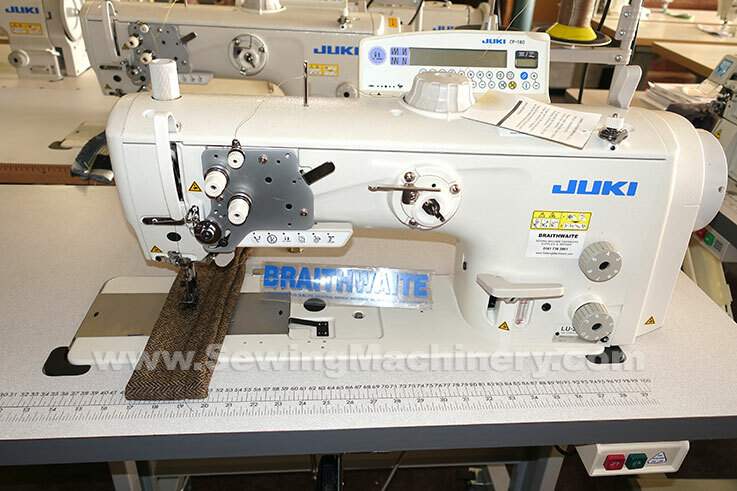 Juki LU-2810 series direct-drive single needle walking foot lockstitch industrial sewing machine with vertical axis large hook and improved functions +performance for sewing large and heavy items such as car seats, sofas and bags etc. This high specification machine ensures high quality seams suitable for various kinds of heavy weight materials. The under arm clearance to the right of the needle is increased by approx. 30% when compared to standard arm models, contributing to improved workability when stitching large and thick materials. Thanks to the improved "Walking-foot/Presser-foot Alternating Vertical Movement Mechanism" and newly adopted "Adjustment of the eccentricity of the feed driving cam", the machine has good responsiveness to the sewing of multi-layered parts, strong and smooth feed of heavy weight materials and ensures constant seams with adequate thread tightness. ●High-torque direct-drive motor is installed. The sewing machine provided with a thread trimmer has adopted the industry's first high-torque direct-drive motor which is suitable for sewing heavy-weight materials. The machine responsiveness ensures increased penetration power into materials even when sewing multi-layered items. Lift of the foot is now 20mm. Processes such as joining leather to thick sponges, which are required for producing luxurious sofas, can be carried out with ease. Good responsiveness to changes in thickness of various materials thanks to the adoption of a feed mechanism which keeps the ratio between the amount of the vertical movement of the walking foot and that of the presser foot constant. The maximum amount of the alternating vertical movement is 9 mm and it is easily adjustable by the large dial installed on the upper section of the sewing machine. In addition to the one-touch type reverse feed switch, a multi-functional 6-string switch is also provided. ●Stitch length can be changed over among different lengths. 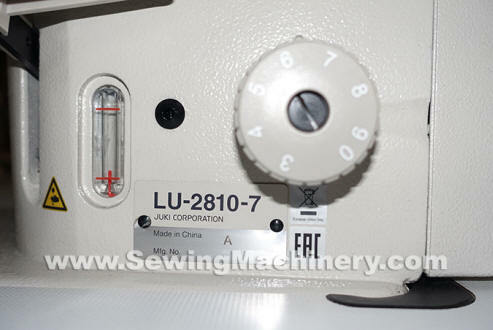 The sewing machine with a thread trimmer is provided as standard with a 2 stitch dials. One unit of this sewing machine is able to sew different sewing lengths since the sewing length can be instantaneously changed over.